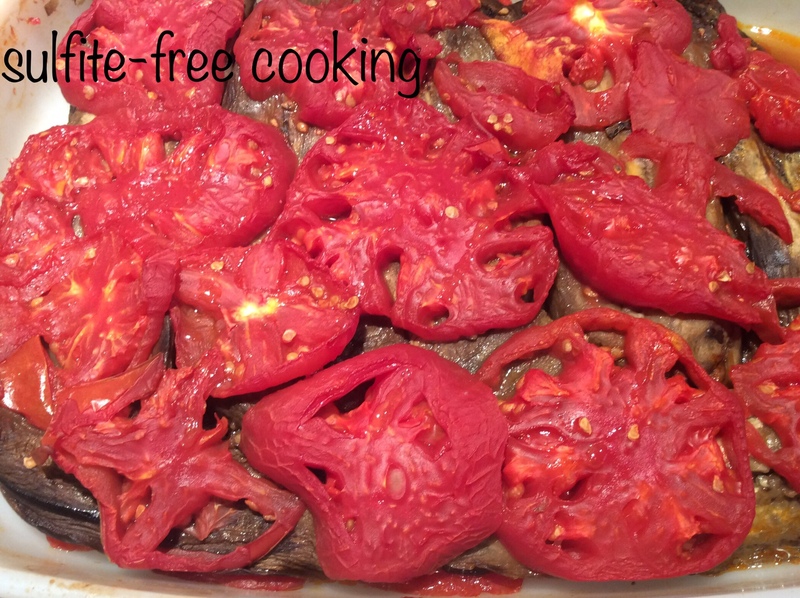 This baked dish combines summer classics, tomato and eggplant. It is easy to make, even if you are new to cooking. Unlike a lot of eggplant recipes, here there is no salt to sprinkle and rinse off after resting time, no frying involved (and consequently less oil used); all you need is to bake the slices ahead of time – so this is not a dish that can be made on the spur of the moment, dear neighbor! I add chorizo or black kalamata olives (in its vegetarian version) between layers. Here in France I am able to buy all natural chorizo, totally free of nitrates, sulfites, sugar or dextrose (a word on this at the end). So lucky! If I were to make it in the U.S. I might substitute the chorizo with some organic bacon slices – it all depends what ingredients are in them. Keep reading those food labels, dear neighbor! 1. Peel eggplant and cut lengthwise into slices. Line a large baking tray or even your oven rack (as in the photo) with parchment paper. Place eggplant slices over paper, trying not to overlap the slices. If they so, don’t worry: they will lose some of their water content and shrink as they bake and you will be able to reorganize the space, without the help of an interior decorator😁, when it is time to turn the slices over. 2. Lightly brush the slices with some olive oil and start baking for 25 minutes. 3. Remove from oven, flip eggplant slices, brush with a little more oil and return to the oven for 15 minutes. Once the slices have cooled down, they can be refrigerated in a glass jar (my preference: more eco-friendly and so much easier to clean than any plastic container!). 1. Peel the tomatoes. This operation is totally optional but fairly easy if the to;atoes are very ripe. Cut into slices, remove the seeds and spread half over the bottom of your baking dish. Add some salt, or not, keeping in mind that the chorizo or the olives already salty. 2. Cover tomatoes with half the eggplant slices. Again, season with salt if desired. 3. Add chorizo slices or black olives. 4. Cover with remaining eggplant slices (and salt), then end with remaining tomato slices (and salt). Drizzle with a little olive oil and bake for an hour total time. After forty minutes, the tomatoes have started to let out some juice, quite a lot sometimes! Remove the dish from the oven and pour out this delicious nectar, carefully tipping the dish over a bowl. You may then use it to cook millet or quinoa (well washed and rinsed), or your favorite pasta. The reason I don’t suggest rice is that you only have 20 minutes left to do it. You can also decide to save this juice in the refrigerator for 2 to 3 days, or for a longer time in the freezer. You may notice that I waited a while before posting this recipe, until temperatures had cooled down a bit. It has been a particularly unpleasant summer for us. We spent most of it cooped up in our house with the shutters closed, unable to go out for our usual walks. But I shouldn’t complain: at least we didn’t have to go out and work! Everything is so dry and sad looking out there… Unfortunately, excessively hot and dry summers seem to have become the norm, which has comforted my habit of not wasting water. And this means not only being careful with how much I use while showering, brushing my teeth and during the other obvious every day water consuming activities, but also reducing the amount of corn (a very thirsty crop) we eat, as well as eliminating corn-derived products, such as dextrose and corn syrup. Every little bit helps, doesn’t it? I wish you a lovely end of summer, dear neighbor!